Fenton, M. B. Bats: Revised Edition. New York: Facts On File Inc., 2001. Fay, R. R., and A. N. Popper (editors). Comparative Hearing: Mammals. New York: Springer-Verlag, 1994. Griffin, D. R. Listening in the Dark. 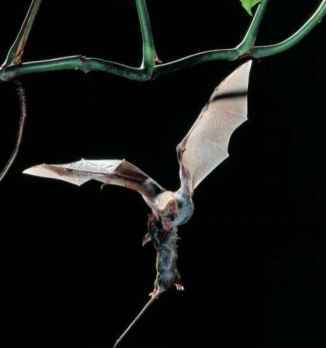 The Acoustic Orientation of Bats and Men. Ithaca, NY: Cornell University Press, 1986. Nowak, R. M. Walker's Mammals of the World, Volume 1. Baltimore: Johns Hopkins University Press, 1999. Popper, A. N., and R. R. Fay (editors). Hearing by Bats. New York: Springer-Verlag, 1995. Sebeok, T. A. How Animals Communicate. Bloomington, IN: Indiana University Press, 1977. Smith, W. J. The Behavior of Communicating. Cambridge, MA: Harvard University Press, 1977. Thomas, J. A., and R. A. Kastelein. Sensory Abilities of Cetaceans: Laboratory and Field Evidence. New York: Plenum Press, 1990. Thomas, J. A., C. A. Moss, and M. A. Vater (editors). Echolocation in Bats and Dolphins. Chicago: University of Chicago Press, 2003. Mammalogy, Fourth Edition. Forth Worth, TX: Saunders College Publishing, 2000. Mammals. Bloomington, IN: Indiana University Press, 1984. Deutsch, C. J., J. P. Reid, R. K. Bonde, D. E. Easton, H. I. Kochman, and T. J. O'Shea. "Seasonal Movements, Migratory Behavior, and Site Fidelity of West Indian Manatees along the Atlantic Coast of the United States." Wildlife Monographs, 151 (2003): 1-77. Daubentonia madagascariensis." Animal Behaviour, 41 (1991): 793-801. Scully, W. M. R., M. B. Fenton, and A. S. M. Saleuddin. "A Histological Examination of Holding Sacs and Scent Glandular Organs of Some Bats (Emballonuridae, Hipposideridae, Phyllostomidae, Vespertilionidae and Molossidae)." Canadian Journal of Zoology, 78 (2000): 613-623. Voight, C. C. "Individual Variation in Perfume Blending in Male Greater Sac-winged Bats." Animal Behaviour, 63 (2002): 907-913.